Thanksgiving can be a trying time for the meatless crowd. That’s because the holiday is so completely bound up with the concept of turkey. For those who are hosting vegans for Thanksgiving — or if you’re going to be the lone vegan at the table, the biggest challenges are choosing a great main dish, an unstuffed stuffing, and a delectable dessert. To that end, here are a trio of recipes and a few Thanksgiving etiquette tips from Vegan Holiday Kitchen by Nava Atlas. 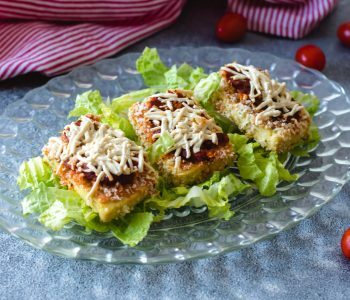 With the addition of seasonal vegetable side dishes and salads that can be shared no matter what the dietary persuasion, everyone will leave the table satisfied. What are you to do if you’re a vegan or vegetarian invited to a traditional Thanksgiving gathering (or, for that matter, any holiday gathering at which you know that meat will be served)? If you’re going to be in the veg minority, volunteer to bring a main dish that you can enjoy (and possibly a stuffing baked in a casserole), and that others can have as side dishes. Be prepared to make a heaping helping; in my experience, everyone else always wants some of what we’re eating! Perhaps you’re a non-veg eater who’s hosting the meal and expecting a vegan or vegetarian or two. If that’s the case, and your veg guests haven’t volunteered to contribute anything (or if you’d like to try making something to impress the new vegan in the family), read on for an alternative main dish, a stuffing, and a vegan pumpkin pie. And make sure explore more of VegKitchen’s vast array of delicious plant-based vegan Thanksgiving recipes. Whichever way you’re inclined, be tolerant of others at the holiday table—this is not the time for guilt-inducing, emotionally charged discussions about eating habits. Vegans usually have a plethora of stomach-turning facts about the meat industry in a file they keep at the very front of their brains; wait for a more opportune moment to expound on the topic. Likewise, devout carnivores shouldn’t use the holiday table as a setting to belittle the choices of those committed to plant-based diets. For the duration of the meal, at least, focus on what those of us of differing culinary philosophies have in common, such as a penchant for yummy sweet potatoes. 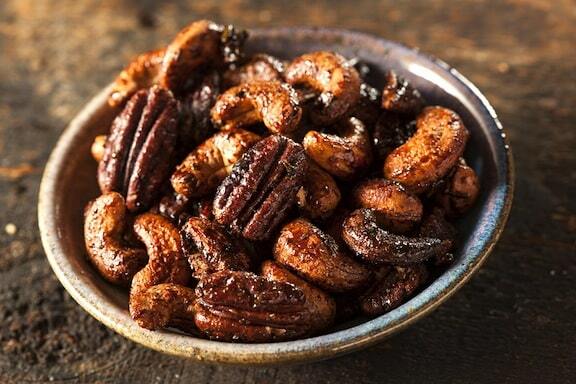 Squash and pecans make for a memorable duo when combined in this Creole-inspired recipe. The savory nut, bread, and rice stuffing, contrasted with the smooth sweetness of the butternut squash, makes a perfect holiday main or side dish. Bake the squashes according to the directions in the sidebar on page 000. Meanwhile, heat the oil in a small skillet. Add the onion and sauté until golden brown. Combine the sautéed onion in a mixing bowl with the bread crumbs, cooked rice, and pecans. When the squash is done and cool enough to handle, discard the seeds, then scoop out the pulp, leaving a sturdy, 1/2-inch shell all around. Chop the pulp, and add it to the rice and pecan mixture. Add the orange juice, more or less as needed to moisten the mixture, followed by the syrup and dried herbs. 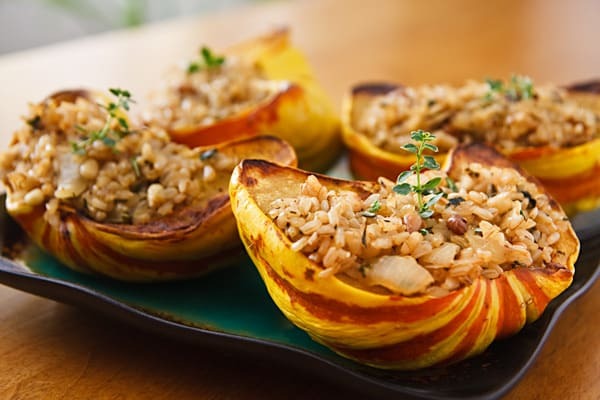 Season with salt, pepper, and nutmeg, mix thoroughly, and stuff the squash shells. Bake for 20 to 25 minutes, then serve. For butternut squashes, serve each squash half as a hearty main dish; or cut each half across to serve 8 as a smaller portion. For golden acorn or delicata, serve each half as a main dish portion. Note: Make fresh bread crumbs by whirling torn slices of whole grain bread in a food processor fitted with the metal blade. For a gluten-free stuffing, use gluten-free bread to make the crumbs. 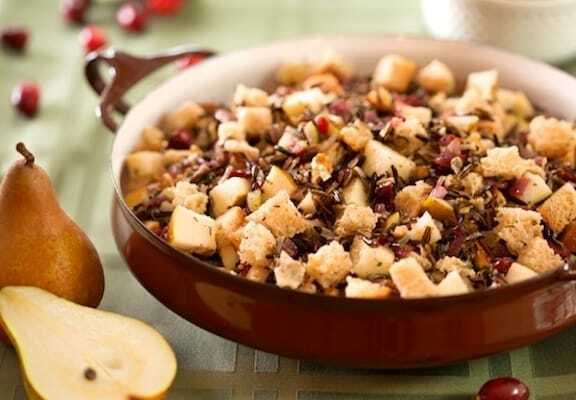 Wild rice adds a wonderful texture to this unstuffed stuffing, and the dried cranberries make it simply delicious. Photo at the top of this post, by Hannah Kaminsky. Bring the water or broth to a simmer in a small saucepan. Stir in the wild rice, bring to a simmer, then cover and simmer gently until the water is absorbed, about 35 minutes. Once done, preheat the oven to 350º F.
Heat the oil in a medium skillet. Add the onion and celery and sauté over medium heat until both are golden. Combine the onion-celery mixture with the cooked wild rice and all the remaining ingredients except the apple juice in a mixing bowl. Stir well to combine. Drizzle the apple juice in slowly, stirring constantly, until the mixture is evenly moistened. Transfer the mixture to a lightly oiled, large shallow baking dish and bake for 25 to 30 minutes, or until the top begins to get slightly crusty. Keep warm until serving. 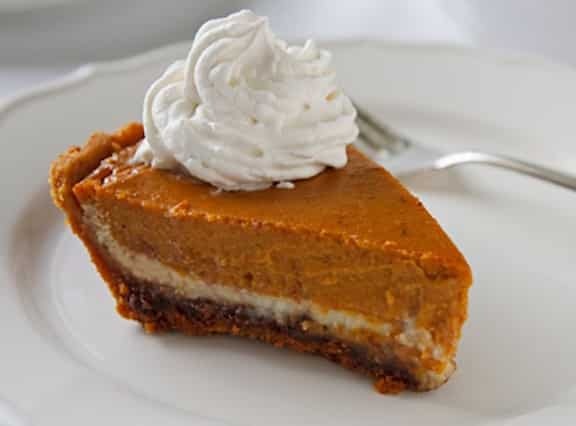 Here’s a cheesecake-like version of pumpkin pie that offers a subtle chocolate twist with each bite. 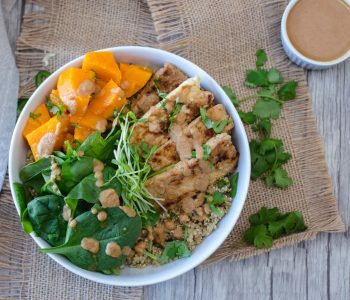 Here is VegKitchen’s full range of vegan Thanksgiving recipes. I made the stuffed squash as the vegetarian option for Thanksgiving last year and it was so popular that I’m making it as the MAIN option this year! Thanks Nava! 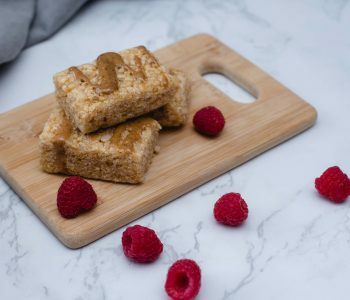 Hi Robert – pumpkin spice is just a handy combination of real spices, including cinnamon, ginger, nutmeg, etc., in the same way that curry is a combination of seasonings. It’s good for those cooks who don’t often use these spices, and so they can buy one seasoning instead of 4 or 5. Saves time and money!